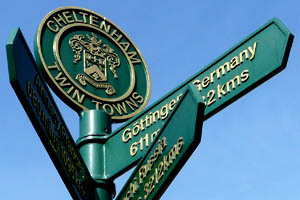 Cheltenham has long recognised the value of international exchange and was one of the first towns to forge formal twinning links in the 1950s. The council maintains an active programme of international events and welcomes the participation of local residents and organisations. Cheltenham has a Twinning Association supported by the borough council, which provides the opportunity for schools, associations and individuals to take part in a wide variety of activities and exchanges.